…often a change in one area of life causes unpredictable changes in other areas of life as well. Transformation begins to happen when we are creating shifts in our lives. These kind of life changes can be powerful and fulfilling. They are also often stressful, challenging, even scary, and can contribute to the very overwhelm we may have been trying to get away from in the first place. What’s more – sometimes on the other side of that “great leap,” the very same inner work, the very same inner healing that was making itself known before the leap is right there waiting for you when you land. The same unease. The same challenges. So it begs the question, why take the leap, why risk the disruption in your status quo? Is the leap you think you “need” to take the right one? How do you really know? What if you could begin to claim the benefits of the big “leap” right here where you are now? What if you could begin the process to align yourself to your true purpose and path without the big scary changes? The big changes may still come, they may still be in your future, but what if you could embark on them from a place of deep knowing, of supreme confidence, and of truly feeling the Universe behind you and supporting you every step of the way. What if you could face transformation knowing it was the right thing to do despite the risk and despite the fear? You can find such a grounded place through increased self-awareness. One of my favorite tools for building self awareness is the Life Wheel. Based on the model of the medicine wheel from traditional cultures, which in turn was based on the circle of cardinal directions (the compass), the “life wheel” has existed in many forms with many functions throughout time. For our purpose it is an amplifier, a tool for assessing and tracking where we are focusing our time and energy and assessing what change and calibrations we would like to make to bring ourselves back into balance and back on path. Creating your life wheel gives you a baseline for where you are now and where you want to go. The beauty of the life wheel is that it is a living, breathing tool that can ebb and flow – grow and swell, to match the rhythms of your days, months and so on. As with a vision board, journaling, or creative scene work, you can gain tremendous power and focus through applying your intention to your life wheel and tracking yourself with it. Keep an eye out for the areas of your life where you over or under allocate your resources. “Resources” being typically time, energy, money, and emotions. Be aware of where you feel realized and complete…where you feel stretched or out of balance, and where there are yearnings or desires to bring new elements into your wheel. These thoughts, creations and musings will be the foundation, the backdrop, of how to begin to align to your true path and purpose in life. Have fun. Go lightly with it. There is no right or wrong way. Your wheel should also include important features of your life: travel? service? joy? nature? exercise? whatever is appropriate for you, your needs, for what you desire in your life. We create our life-wheel by drawing a circle and adding ‘spokes’ that represent these key areas of our life. We then consider each spoke, evaluate how we are showing up in that area, and rate ourselves on a scale of 1-5. Example, if you are feeling unproductive at Work, or your Body is feeling depleted today, enter a lower score. Example: If you have a lot of Love in your life, for yourself, for others, for the world, or your “Mind” is feeling particularly sharp and productive, enter a score that is closer to your ideal. Example: Or, you could be working long hours and feeling overwhelmed or exhausted: enter a score above your ideal for Work. Why did I score yourself in each category the way I did? What action could I take today and going forward to improve this aspect of my life? What help could I ask for? From whom? What purpose is the energy I’m putting into this high-scoring aspect of my life serving? How might I redirect some of this energy into aspects of my life that may need it more? Now reflecting on your wheel, consider, the biggest gaps in your satisfaction levels? This might mean I need to focus more energy on this aspect of my life, or it could mean pulling back and finding ways to spend less time and energy there. What are the specific actions or steps that you are going to take to enhance your satisfaction in your targeted areas? Take note of what you will do, maybe post your goal to Facebook, or email it to a coach or advisor, and commit openly to taking the steps you need to bring your score closer to your ideal. An important thing to remember is that this is your life wheel. Is it wobbly? or is it balanced? As you focus on finding balance between the different aspects of your life, you will find that you are living a more peaceful, purposeful, FULLER life. Have an iPhone? Try Using Shift, a life-wheel App available on iTunes. Shift is simply a tool to facilitate the process of using a life wheel. There is no right or wrong way to use it – and you can determine what frequency you want to log your info. I recommend starting out by using it daily while you are setting the foundation – but as you move on you can decide whether daily or weekly (or maybe even monthly?) is a comfortable rhythm and frequency for you. Don’t forget you can always create your own wheel as well. Paint one, journal one,…get creative with it!…and feel free to make the process your very own. There is no right or wrong way to use Shift. It is a tool to support your life balance, manifestation and magic in your world. If you have an iPhone download it and try it out. Here are some ways to start using the tool – experiment – make it your own! To use Shift Wheel, spend a few moments getting to know the categories provided. You can click on each for more guidance for reflection. Ask yourself, “what is my ideal score for this category?” It may not be a 5. Do I want that ideal score to change in the next month, 3 months, 6 months? Do I hope to increase the time I spend in Nature, or perhaps decrease my time (or be more productive) at Work? If you’ve upgraded to Shift Wheel + with 8 custom fields, you can add your own personal categories (maybe Sleep or Play?) and perform this same reflection for each. Next, use the method described above to track yourself in each category and then see your wheel in living color. Track your progress! Shift Wheel not only provides a snapshot of your current satisfaction levels, it permits you to track, view, and analyze those levels over time. Complete your Wheel on a regular basis so you can easily track your progress. Remember the very first step in aligning to your heart’s call and true purpose and passion in life is to believe in yourself. To listen deeply and to honor your own unique experiences and journey. For more inspiration and to hear about other’s transformational Shifts you can check out the Shift Series here. Lindsay wants to live in a world where appreciation flows freely, kids play outdoors and lemons are in season year round. 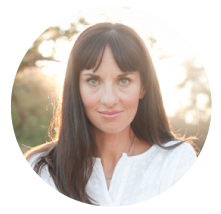 As a Mystic mama, tech entrepreneur and wellness “Inspirer-in-Chief” she’s a sought after contributor and motivator on all topics health, healing and transformation. When she is not extolling the virtues of self-tracking or “Resonance” based business, you can find her knocking almonds and generally getting her gratitude on. Lindsay’s new paradigm business community. Find out more about Lindsay’s private consulting at Lindsaypera.com/mentoring or join in the magic at the MysticSociety.com.